Have you ever tried to change your leadership behavior? Have you ever received 360-Leadership feedback and attempted to make changes? I am not a fan of dramatic aha moments! I don’t believe that change happens by breaking out of your comfort zone or that for you to change you need some shock to your system. Most change that we notice happens through small shifts in perspective and effort. Many times you don’t see what is working to amplify, and you are unaware of what is not working to dampen. 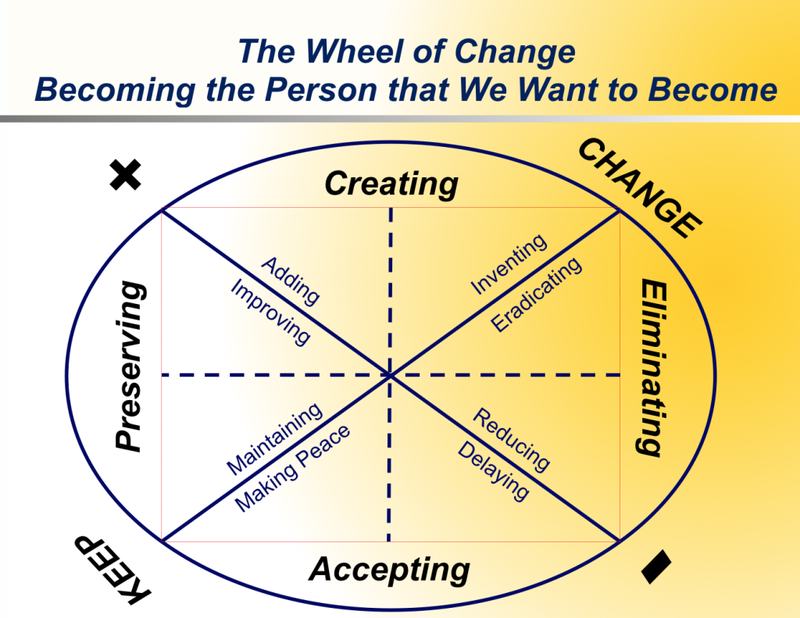 In an earlier post – Personal Accountability to Change – I referenced Marshall Goldsmith’s Wheel of Change. When we work together through executive or leadership coaching, changing your behaviors is the purpose. When you read through 360-feedback, and we discuss the feedback plus data gathered from multiple perspectives, the next step is to identify leadership behavior changes you will create, eliminate, preserve, and accept. As you create these leadership behavior changes we craft a process to keep you accountable and mindful of your effort and progress/regress. That is where the daily check-in and update happens. From the responses and data, we identify the behaviors you are looking to create, eliminate, preserve, and accept. We turn the statements into questions that determine your daily effort. Framing the leadership behavior change as a question of your effort gives you accountability over your changes. As you read through your daily questions you scale your effort from 1 being very little, to 10 being maximal. The photo on top of this post shows my leadership behavior change questions and efforts into January 2019. As you continue the daily check-in some days are great and some days stink …. some days you start with the greatest of intention and get nothing done … some days you accomplish everything at a 10.
daily phone call – I call you every day at the same time and ask you to go through your leadership behavior change list and share your scored effort. weekly coaching meeting – we meet or have a phone call every week, during the call we review your scored effort and ask about what you wish to amplify and dampen. accountable team meetings – your team chooses to make 15 minutes per/week to share and discuss your scored effort. you and your manager or direct report – do this process together and meet every day for 5 to 10 minutes to share scored effort and discuss the day. What makes this process work? you control what you wish to change and put effort into. the daily practice taking 5 to 10 minutes to read and self score your effort on areas of leadership behavior change that are important to you. knowing that someone besides you is going to ask you about your leadership behavior change and scored progress keeps the effort and check-in happening. each behavior is something active that you can change, it does not depend on someone else to do something for you or for someone else to change. doing this as a team or with a peer creates a shared model and process, having shared language for change helps to discuss and support small steps that work. I believe in being a part of the same process I ask you to go through. 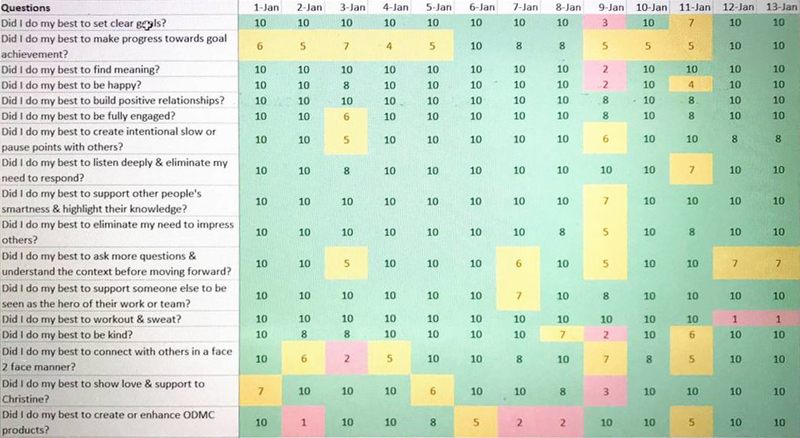 Below are my 17 questions that I rate my effort from 1 – 10 on daily. Did I do my best to make progress towards goal achievement? Did I do my best to create intentional slow or pause points with others? Did I do my best to listen deeply & eliminate my need to respond? Did I do my best to support other people’s smartness & highlight their knowledge? Did I do my best to eliminate my need to impress others? Did I do my best to ask more questions & understand the context before moving forward? Did I do my best to support someone else to be seen as the hero of their work or team? Did I do my best to workout & sweat? Did I do my best to be kind? Did I do my best to connect with others in a face 2 face manner? Did I do my best to show love & support to Christine? Did I do my best to create or enhance ODMC products? Does leadership development need boundaries?